The Back of the Book: An exploration of the meaning and scriptural resonances of the words of the Mass, using the new translation. The new English-language translation of the Missal uncovers many links between Scripture and the Liturgy that have hitherto been obscured. 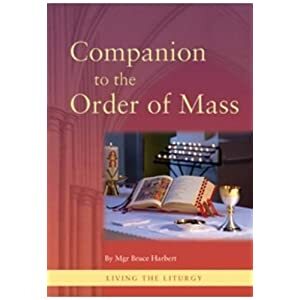 Mgr Harbert, former Executive Director of the Secretariat of the International Commission on English in the Liturgy, explores the meaning and import of the words of the Mass, reading them in their original context in the Bible, so helping us to rediscover the richness of the Liturgy. This will help Mass-goers both now and long into the future. NotJustLaura’s Review: Sometimes books do just what it says in the blurb and this is one of those books. I bought it when I heard that my Parish would be an early-adopter of the new liturgy, starting to use it when the schools went back after the long summer holidays rather than waiting until the new Church year at the beginning of Advent. I wanted to know why things were changing from the familiar and comfortable to the new Order of Mass. Mgr Harbert goes through each section of the new translation and explains why certain words have been chosen over others and brings out the ideas behind the words. I found this little book a very valuable guide to the changes and am sure it is one I will turn to again and again as I become used to the changes and ready to enter into the words more deeply.